Fielding Lewis by John Wollaston, ca. 1765. This portrait has been in the Kenmore Collection for many decades. It was recently returned to the Drawing Room, where it would have hung when the Lewis family lived in the house 200 years ago. Watch a video of the hanging process here. Editor’s Note: This Memorial Day, we again remember ‘The Monuments Men’ and their invaluable work to locate and save European art looted by the Nazis during World War II as well as their continued efforts to conserve and preserve art after the war, including art at Historic Kenmore. This post originally appeared on Lives & Legacies on May 20, 2015. Recently, while flipping through old files of the Kenmore Association dating back to the 1920s and looking for anything related to our portrait of Fielding Lewis by John Wollaston (ca. 1765), I spotted a familiar name: George Stout. It took me only a moment to realize why the name was familiar. Those of you who read Robert Edsel’s book The Monuments Men: Allied Heroes, Nazi Thieves and the Greatest Treasure Hunt in History or saw the movie The Monuments Men starring George Clooney, Matt Damon, John Goodman, and Bill Murray may also recognize the name. During World War II, George Stout was a member of the U.S. Army’s Monuments, Fine Arts, and Archives unit, nicknamed the “Monuments Men.” These soldiers volunteered to leave their jobs as curators, historians and conservators to travel the frontlines in Europe, documenting, cataloging and in some cases saving priceless cultural artifacts in harm’s way. Along with serving as a Monuments Man, Stout is widely considered the father of modern methods in art conservation in the museum world. He’s kind of a rock star to all of us who work in museums, as are all of the Monuments Men. It is not often that curators get to be the hero, but those men were. Lieutenant George Stout, U.S. First Army and U.S. Twelfth Army Group. Age: 47. Born: Winterset, Iowa. A towering figure in the then obscure field of art conservation, Stout was one of the first people in America to understand the Nazi threat to the cultural patrimony of Europe and pushed the museum community and the army toward establishing a professional art conservation corps. As a field officer, he was the go-to expert for all the other Monuments Men in northern Europe and their indispensable role model and friend. Dapper and well-mannered, with a fastidiousness and thoroughness that shone in the field, Stout, a veteran of World War I, left behind a wife, Margie, and a young son. His oldest son served in the U.S. Navy. 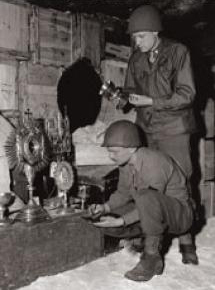 From the Walter Hancock Collection courtesy of the Monuments Men Foundation. ALTAUSSEE, AUSTRIA – JULY 10, 1945: Removal of priceless works of art from the salt mine at Alt Aussee posed problems for Monuments Man George Stout unlike any ever contemplated. Stout constructed a pulley to lift Michelangelo’s Bruges Madonna onto the salt cart to begin its long trip home to Belgium. Visible on the far left is Monuments Man Steve Kovalyak, an expert in packing art, who was a key assistant to Stout. National Gallery of Art photo courtesy of the Monuments Men Foundation. 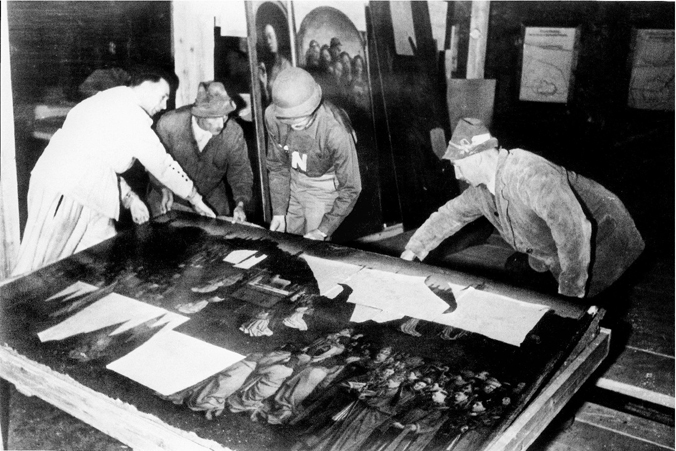 After the war, many of the Monuments Men returned to their museum jobs where they continued to work together, revolutionizing the care and conservation of artwork and historic objects. They established standards for conservation practices, ethics for conservators, and tested new scientific methods for preserving all varieties of artwork. Perhaps their greatest legacy was that many of them established schools for training conservators, ensuring the future of the field. For the first time, American museums had a cadre of experts to turn to when masterpieces in their collections needed help. Kenmore’s old files perfectly reveal the post-war story of George Stout and the Monuments Men. It’s a story that also involves numerous other luminaries of the art conservation world such as John Walker, Harold Cross, Sheldon and Caroline Keck, and Russell Quandt. It all started in 1949, when John Walker, then Chief Curator of the National Gallery of Art, visited Kenmore. His visit moved him to write a letter to Kenmore’s own Louise DuPont Crowninshield, praising the Kenmore Association for its work in saving the property and for its fine collection, which included the Wollaston portrait of Fielding Lewis. Mr. Walker felt very strongly that the Wollaston portrait was in need of immediate conservation treatment. He recommended a young man named Harold Cross, the new restorer at the Corcoran Gallery of Art in Washington, D.C., for the project. John Walker was not a Monuments Man but he was heavily involved in the complicated and tedious post-war effort to identify artwork looted by the Nazis. 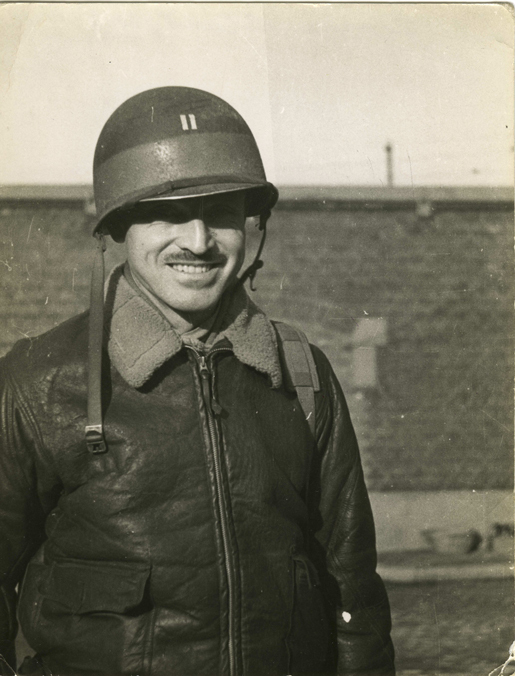 This brought him in close contact with many of the Monuments Men over several decades. He suggested the Kenmore Association contact George Stout, then at the Worcester Museum of Art, to get a personal testimonial as to Harold Cross’s abilities. Cross apprenticed under George Stout, receiving training in Stout’s scientific methodology. Mrs. Crowninshield contacted Stout, who highly recommended his former student. Cross performed the first ever restoration of the ca. 1765 Wollaston portrait. The post-war Monuments Men network had made its first mark at Kenmore by saving our only image of Fielding Lewis. Lieutenant Sheldon Keck (kneeling), United States Army. Read Keck’s biography here. Courtesy of the Monuments Men Foundation. The next involvement of the Monuments Men with the Wollaston portrait came in 1952, when the ladies of the Kenmore Association became concerned that the portrait was warping at an alarming rate. Through personal connections, they learned that Sheldon and Caroline Keck would be visiting Colonial Williamsburg in January. Sheldon Keck was a former Monuments Man and the chief restorer at the Brooklyn Museum of Art; his wife Caroline was also a restoration specialist at the same museum. Together, they trained more than 150 conservators before they retired. Their presence in Virginia was fortuitous, and the decision was made to pack up the Wollaston and have Executive Director Mary Mason take it directly to Williamsburg. Mr. and Mrs. Keck agreed to take a look at the painting, and apparently performed their treatment of it in their hotel room, “re-keying” the wooden stretcher so as to tighten the canvas and reduce the warp. The Kecks did not charge for their emergency services “in the field”, rather they indicated that it was their pleasure to assist in the preservation of such an important work. Finally, in 1957, the Wollaston portrait’s care was passed on to the capable hands of another heir to the Monuments Men legacy. When new preservation issues surfaced, the Kecks recommended a former student of theirs, Russell Quandt, examine the painting. Over the next decade, Mr. Quandt would be the primary conservator of the portrait, performing treatments on it both on-site at Kenmore, at his lab at the Corcoran, and eventually at his own private-practice studio. 1/2 – Initial letter from John Walker to Louise Dupont Crowinsheild, October 18, 1949, offering to assist in the conservation of the Wollaston portrait of Fielding Lewis. Kenmore Manuscript Collection. 2/2 – Walker recommends Harold Cross to do the conservation work and suggests contacting George Stout for a reference. Kenmore Manuscript Collection. Letter from Sheldon Keck to Mrs. Alfred Bissell, February 11, 1953, reviewing the need for keying the paining and also recommending Russell Quandt and several others for any future restoration work needed on the Wollaston painting. Letter from Russell Quandt to Mrs. Robert A. Adams, February 5, 1957, asking the painting be ready for him to examine during a trip through Fredericksburg. Kenmore Manuscript Collection. All told, the Monuments Men were either directly responsible, or had trained those responsible, for the preservation of Kenmore’s Wollaston portrait for almost 20 years. It can be argued that they continue in that role today, as we hire conservators whose professional training has been a direct result of the methods, systems and institutions established by them. Many of today’s conservators are still inspired by the wartime service of the Monuments Men. As Memorial Day approaches, the museum world in both Europe and in this country owes them an immense debt of gratitude. Visit http://www.monumentsmenfoundation.org/ to learn more about George Stout and Sheldon Keck, their comrades, and their wartime work. 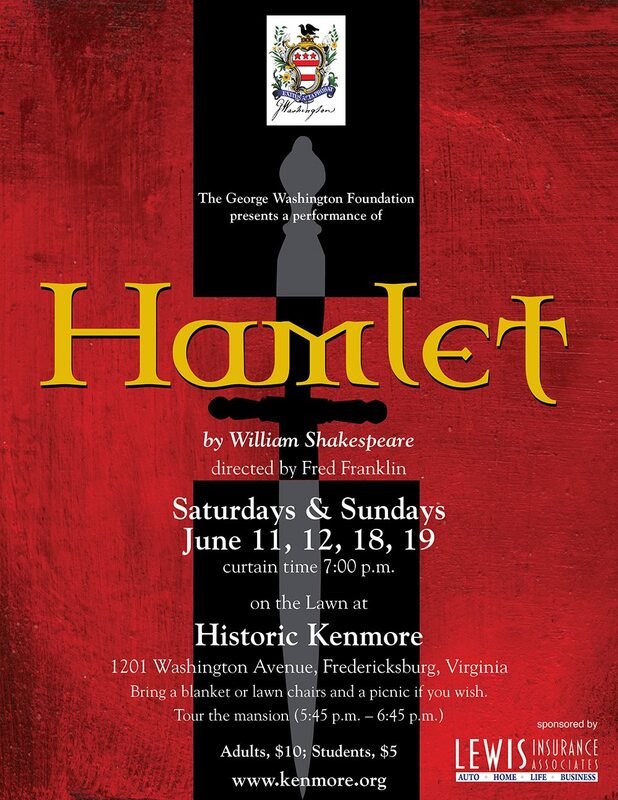 Editor’s Note: At the annual Shakespeare on the Lawn performances this June, Historic Kenmore will present Hamlet. The following blog post looks at the actors who played the most famous of Shakespeare’s roles during the 18th century. Details about attending the performances at Kenmore can be found at the end of this entry. Since the time when Richard Burbage of The Chamberlain’s Men first performed the role originally written for him by William Shakespeare, actors have long desired to play Hamlet. As a character, Hamlet must convey both a flamboyant madness and a subtle deception, deliver long speeches of blank verse, and ultimately end the play with exhausting fight scene and tragic death. These highs and lows have made actors covet the complex role for centuries. In the 1700s, Hamlet was wildly popular in London in part due to famous portrayals by different actors. At the beginning of that century, Thomas Betterton was still portraying the young Prince of Denmark as he had first done on London stages back in 1661. Although his portrayal of the young Dane spanned 50 years, theatre-going Londoners still praised Betterton’s Hamlet into the eighteenth century. If there was one name to know on the London stage in the 18th century, it was David Garrick. As a writer and actor, he was synonymous with celebrity. 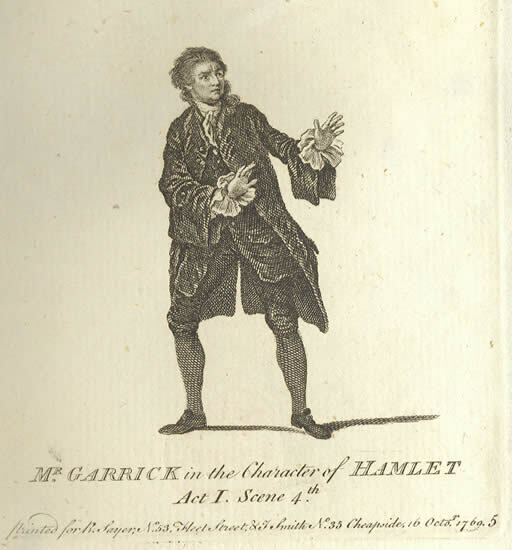 Garrick’s portrayal of Hamlet in the 1740s was one of the performances that made him into that celebrity. He would go on to perform his own adaptation of Hamlet, which omitted Ophelia’s and Gertrude’s deaths, readjusted act breaks, and reintroduced much of Shakespeare’s original text. The original text had slowly been stripped away throughout the 1700s due to the play’s length. It was Garrick’s unique theatricality that inspired him to employ a striking feature. During the scene when Hamlet first meets the Ghost he wore a special wig with hair that could stand on cue to signifying his terror. Not to be out done by men, actresses of the 18th century were also known to perform Hamlet on English stages. In what were known as ‘breeches roles’ at the time, it was common to see actresses step into men’s roles. However, this was far more common in comedies than in tragedies. Both Fanny Furnival (the first recorded female Hamlet) and Charlotte Charke (daughter of playwright and poet laureate Colley Cibber) played the role of Hamlet, albeit never on a London stage. 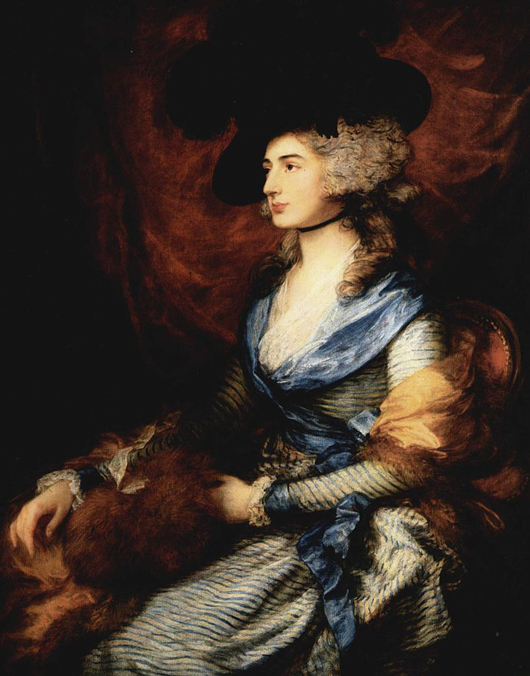 The most famous eighteenth century female Hamlet to tread the boards was Sarah Siddons, who brought a respectability and gravitas to the role that raised the public esteem of actresses across England. While these different depictions of Hamlet are fascinating, they never crossed the Atlantic. In fact, the first group of professional actors would not perform in the colonies until 1752. At the center of this London Company of Comedians was the Hallam family. They came to the American Colonies in search of audiences seeking quality professional theatre. On September 15, 1752, their first performance was The Merchant of Venice in Williamsburg, Virginia. That evening would also be the debut performance of the young Lewis Hallam Jr., son of the company’s manger and leading lady. Lewis would go on to become the leading man of the company. In the first recorded performance of Hamlet in the colonies in Philadelphia on July 27, 1759, the playbill lists 17-year-old Lewis in the title role. He and his company would tour the colonies for the next 15 years until the American Revolution forced theatre from our shores. 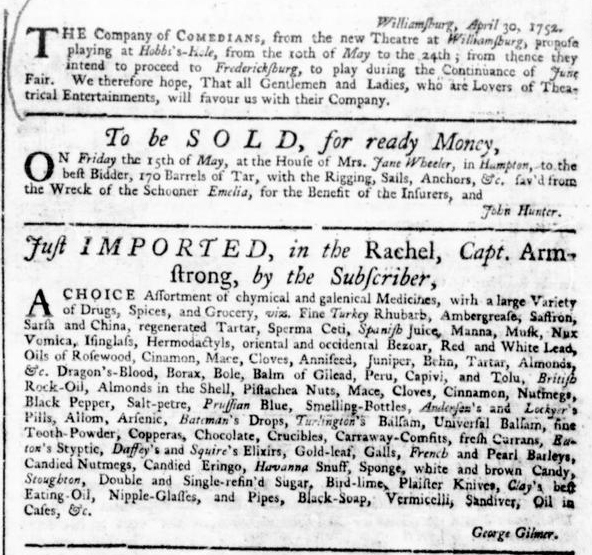 Hallam’s Company of Comedians announcing their intention to perform in Fredericksburg in The Virginia Gazette on April 30, 1752. Not all colonial Americans had the opportunity to see Hamlet upon the stage. Theatre was banned in Massachusetts throughout the colonial time period. Thus, Williamsburg was a frequent stop of Hallam’s company, which came to be called the American Company of Comedians. Of all the recorded performances in Virginia’s capital city, Hamlet is not listed, however. This does not mean that the likes of George Washington and Fielding Lewis could not have seen it. In fact, a playbill from May of 1771 reveals the American Company of Comedians performed in Fredericksburg, Virginia. This surviving playbill includes a handwritten addition of two performances, All in the Wrong and Hamlet. While the playbill does not include that evening’s cast, we can safely assume Lewis Hallam Jr. played the title role opposite Nancy Hallam as Ophelia. We wrote about Nancy here last summer. If people are familiar with any words of Shakespeare, those words are most likely the beginning of Hamlet’s famous soliloquy: “to be or not to be?” But the real question for Shakespeare’s theatre going audiences has always been “to see or not to see?” Ultimately, the decision was made based on the actor (or actress) playing the famous Dane named Hamlet. Beautiful flowers are in bloom in the demonstration garden at George Washington’s Ferry Farm! In today’s world we keep our valuables, like money, important documents, jewelry, etc. locked safely in a bank vault or safety deposit box. These options for safe-keeping of valuables were not available in 18th century America, and so our ancestors had to be a bit more creative in hiding their important items from would-be thieves or prying eyes. Probably the most romanticized method for securing valuables was the use of hidden or secret compartments in furniture. There is no shortage of novels or plays that use a secret compartment to hide the key to the mystery. In actuality, these secret compartments were fairly rare and usually reserved for only the wealthiest of people, those who could afford not only to commission custom furniture, and perhaps pay for the joiner’s silence about the location of the hidden drawer or concealed box. Still, when a curator encounters an 18th century case piece, one of the first things they look for is any sign of just such a feature. Two candidates at Kenmore for hidden compartments have thus far revealed nothing. Betty Lewis’s desk, now on display in the Chamber, is a likely suspect because of how it would have been used during it’s time in the Lewis household. Betty’s desk was the hub of her “command central.” She ran every aspect of the household from that desk, including the management of funds and the storing of expensive foodstuffs, like spices and sugar. The spices were kept under lock and key and doled out to kitchen servants as needed, while money would have been kept under strict supervision. Either could be a candidate for storage in a secret compartment in the desk. Although the desk contains a multitude of tiny drawers and divided pockets, many with tiny key locks, we haven’t yet found a truly hidden space. Betty’s desk in the Chamber at Kenmore. Betty’s desk has numerous cubby holes and drawers. While not a true secret compartment, one drawer of the desk is somewhat camouflaged. Another, perhaps even more intriguing, possibility is the bookcase-on-desk currently displayed in Fielding’s Office. This piece does not have a Lewis family provenance, but its history includes a span of time when it was used in the back room of a store, as the proprietor’s desk. It, too, has a variety of drawers and doors, many of which were marked by the shopkeeper as to what went in each. Surely, this piece must have at least one hidden compartment, a place for the shopkeeper to hide the day’s earnings or extra cash. But sadly, nothing has surfaced yet, despite our best efforts. The bookcase-on-desk in Fielding’s Office. Drawers with the shopkeeper’s markings. What Kenmore’s desks may lack in hidden compartments, is made up for by the house itself. During Kenmore’s most recent restoration, a group of painters made an exciting find. While stripping old paint from woodwork around a window on the second floor, a small section of paneling fell out of place. At first, the painters were concerned that they had inadvertently broken original material, but upon closer inspection it quickly became clear that the small panel was intended to come loose from the surrounding woodwork. Behind the panel was an open cavity between the decorative woodwork and the brick masonry of the wall. And, to everyone’s astonishment, embedded in that masonry was a tiny drawer-front, with a little handle. It turned out that during the original construction of the house, this small drawer had been built into the brick below the window in such a way that it could be accessed through a false panel in the woodwork. The drawer was empty when the painters found it, but there are a variety of theories about what it might have originally held. Money or important documents are the most likely items, but suggestions have been made that Fielding might have concealed a gun there for personal protection, especially during the final months of the Revolution, when the Washington and Lewis family members were at risk of being kidnapped by the British for ransom. Other theories have suggested that because Fielding was a frequent correspondent with General Washington, he concealed their letters in the drawer so that they wouldn’t fall in to enemy hands. Does the secret compartment’s location under a window that overlooks the town of Fredericksburg and all the way down to the riverfront where Fielding’s ships were docked provide a clue? And why would the compartment be placed in this particular room to begin with? It was simply a bedchamber, probably used by guests. While we may never know what secrets the hidden drawer contained in Fielding’s time, we do know that today it has become a time capsule of sorts and holds the business cards of anyone who has worked on Historic Kenmore. As with many aspects of Kenmore, there are many questions about this little drawer. While we may never know the true story behind it, it allows for some imaginative possibilities! In this video, we discuss the importance of using archival glue to mend artifacts and demonstrate the process used to make this special glue. The goal of studying archaeological artifacts and, indeed, the goal of studying history more broadly is to understand the people who lived in the past both in the small moments and in the times of monumental change. Something as ordinary as the beverages people drank and the objects from which they drank reveal what life was like in the past. In this post, we examine three popular beverages, the vessels used to drink them, and their historical significance. Tea: In the 18th century English speaking world, tea was synonymous with high society. Not only was the tea itself expensive (since it was shipped from across the globe) but the entire culture around tea was costly. One could not serve tea without a proper tea service or equipage. The first English references to tea come from early 17th century English merchants abroad in Asia. However, tea wouldn’t enjoy universal English adoration until later in the century when Charles II married Princess Catherine of Braganza of Portugal in 1662 and brought the practice from Europe into England. From then on, tea represented wealth and high society wherever the English went, including across the Atlantic. Over a hundred years later, however, Parliament inadvertently changed tea’s beloved status amongst their North American colonists as colonists boycotted the drink to show their displeasure with the mother country’s rule. Even with that change, tea remained a highly-prized status symbol among many and even inspired some Americans to create ‘Liberty Teas’ from locally grown herbs and fruits. Like the tea itself, teawares (the vessels in which tea was prepared and served) were fashionable and reflected societal trends. Well-to-do families like the Lewises of Historic Kenmore exhibited their finest teawares and were expected to update their china cabinet with the most stylish wares they could afford. Silver topped the list followed by porcelain. If those were lacking, elaborately decorated and finely potted stone and earthenwares would do in a pinch. At the end of the Revolution, Fielding and Betty Lewis were reeling from wartime expenses so their teawares likely resembled this lovely creamware piece with a delicate strawberry flower at the base of the handle. While not the most expensive teaware at the time, this molded creamware exhibited good taste and was suitable for the Lewis family to use while serving tea to their guests. Punch: Much like tea, punch was also a status symbol in the 18th century. A punch’s different ingredients usually came from all over the world and were therefore quite expensive. Punch is first written about by 17th century English sailors. The word ‘punch’ is believed to come from the Hindustani word ‘paanstch’, meaning ‘five’, and may explain why historic punches have 5 parts: sweet, sour, strong, weak, and spice. Typically, the sweet was sugar, the sour was a citrus fruit such as lemons, limes, or oranges, the weak was water or tea, the strong was alcohols like rum or whiskey, and the spices could be nutmeg or cinammon. These 5-parts allowed punch to be made from any number of ingredients and to take on unique identities and flavors. Punches varied greatly between taverns and recipes (receipts) were closely guarded secrets. What was not flexible was the necessity of punch. Colonials could hardly have an elegant ball, a large celebration, or even a small get-together without the ubiquitous drink. 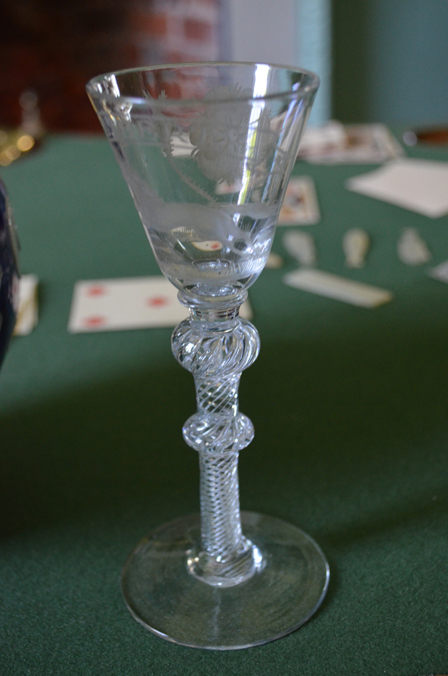 As with tea, imbibing punch was a communal event requiring fancy equipage. The bowls themselves ranged from elaborately decorated to elegantly simple and came in many sizes. The smallest served a single individual while grand bowls served lavish parties with dozens of tipplers. Some bowls even conveyed political opinions or leveled jokes at members of society. Suitable for a modest gathering of friends, this tin-glazed punch bowl displayed at Kenmore was owned by the family during their more prosperous pre-war days. 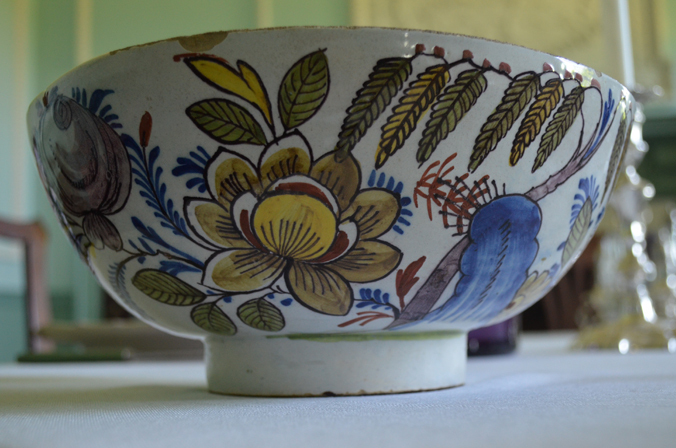 By the time they moved to Kenmore, however, this cheerfully hand-painted bowl was falling out of fashion. Tin-glaze was less refined than later wares and was easily chipped and cracked, making it less desirable. Fortified wine: In 18th century America, fortified wine reigned supreme. Lacking our own wine industry, despite the best efforts of Thomas Jefferson and others to establish wine grapes in the colonies, we relied on imported wines from Europe. Because of the ocean journey, fortified wines such as Madeira, port, and sherry became very popular. These wines shared one thing in common: The fermentation process was halted by the addition of brandy. This upped the alcohol content considerably and made the wine portable over long distances. Most wines prefer a quiet life in a cool environment. Fortified varieties, however, thrive on chaos and age better when subjected to extremes of temperature, humidity, and constant sloshing around in the belly of a huge ship. These choice wines even exhibited labels documenting their torturous journeys. Wines that traveled south of the equator before eventually making their way up the coast to the colonies were especially prized. Once a fortified wine found its way into a household, it was likely stored in an attic or on a portico, where it would continue to improve while battered by cold winters and sweltering heat. Today, fortified wines are considered desert wines to be consumed after dinner. The colonists, however, needed no such excuse to pop open a bottle of fine Madeira. They did, however, traditionally drink these more potent wines from smaller glasses. This lovely lead glass example is hand-blown and engraved using a copper wheel. Probably manufactured in England in the late 1700s, one can only imagine the delicious wines it once held! Apple Cedar Rust: What on Earth is It and Why Does It Matter? Sometimes nature can be stranger than fiction. At George Washington’s Ferry Farm, we are currently experiencing such a phenomenon: Apple Cedar Rust. Hideous in appearance, yet strangely fascinating, this fungus erupts on our cedar trees every few years when temperature and moisture are just right. It’s a monstrous growth with bright orange tentacles. Like some bizarre alien fruit, they hang from the cedars after which they shrivel up and disappear until the conditions are just right for the fungus to become active again. But what are these odd gooey orbs, called ‘galls’, on the cedars and what do they mean in a greater context? Well, what we are seeing at Ferry Farm and all around the Fredericksburg, Virginia area is actually only one stage in the life of the Apple Cedar Rust. This fungus requires two trees to complete its two year life-cycle, as is evidenced by its name. The gall on the cedar erupts with orange protrusions, called ‘horns’, during the spring and release millions of spores that will float on the wind for several miles trying to find an unsuspecting apple or crabapple tree in bloom. At this point, the spores infect the leaves and blossoms of the poor tree, causing unappealing blemishes on the fruit and, occasionally, a total loss of the apple crop. At the end of the summer, the fungus that developed on the underside of the apple leaves also releases spores that travel back to the cedars, where they lay dormant for over a year before eventually sprouting the orange jelly-like grows and starting the cycle again. This disease had the potential to devastate colonial-era apple crops. Although wild crabapple varieties were native to the Americas, European immigrants quickly introduced domesticated apples to the New World and widely cultivated the fruit. Baked into pies and puddings, dried, turned into preserves, and even added to savory dishes, apples were very popular. Not just prized as a food, the delicious fruit was also commonly converted into hard cider, which could be stored much longer than fresh apples and rivaled beer in popularity with colonials. In years of abundant crops, excess apples could even be used to finish livestock prior to butchering. As such, most colonial households grew at least a few apple trees. The loss of some or all of this fruit would have been tragic. Native Americans also suffered the loss of indigenous crabapples, which provided food for them and for animals they hunted and relied on. It is unclear if the complex phenomenon of Apple Cedar Rust was understood by European settlers and Native Americans. Did they know that the strange orange masses on cedar trees signaled a drop in apple yields? It is a question to ponder. Lacking the fungicides of today, early Americans’ only recourse would have been to destroy all the cedars within a few miles of their trees – not a very practical solution. Most of us today do not grow our own food so Apple Cedar Rust is merely a gross curiosity, but to colonial farmers and past inhabitants of the early North American landscape, the ugly fungus may have caused real problems.